Great things come in twos and who doesn't love a good deal? DoubleTake is here to provide quality eyewear that will have people taking a second look, without taking a lot out of your wallet. Our glasses are effective, comfortable, compact, and elegantly designed - and best of all, they come in pairs. So not only are you covered night and day, home and office, work or vacation, you also get the most out of your money. We offer glasses in a wide selection of styles from classic rimless frames to vintage-inspired glasses with a modern spin. Find your match today! Looking for a reading glasses solution that is portable and can be thrown in your bag? Better yet, how about ones that are small enough to fit in your pocket? Look no farther than DoubleTake Folding Readers. 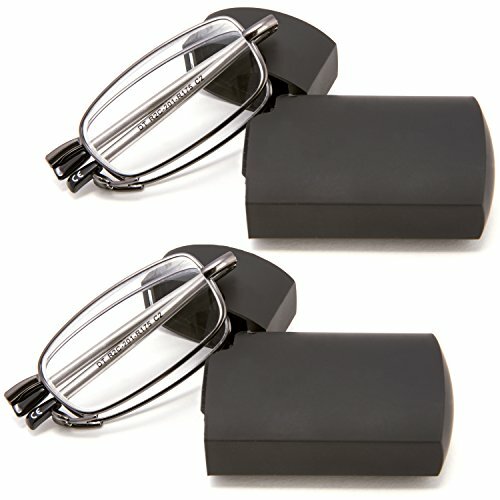 These small and light readers feature telescoping temples for easy folding and compact storage. Each reader comes with a flip top hard case to ensure your lightweight readers are protected and easily accessible. Fold, flip, and drop your pair of DoubleTake Folding Readers into your pocket or purse and be reading ready wherever you go. - Compact: folded reader in carrying case is about the size of a lighter! If you have any questions about this product by DOUBLETAKE, contact us by completing and submitting the form below. If you are looking for a specif part number, please include it with your message.